If you just want to take a picture, you use your iPhone. But what if you want great quality? Not “great for a phone”, but plain great? You shoot with a DSLR camera. Unfortunately, DSLRs are painfully outdated. With them you can’t tweet or email photos, you can’t crop or adjust them and you can’t organize your library. And to get your photos anywhere, you’ll need a cord or a compatible card reader. This is ridiculous given that it’s 2012. Adding all these features to cameras, on the other hand, seems unrealistic. It will take years of work and the UI will be terrible. Doubt it? Just look at your current camera buttons and menus and imagine setting up a twitter account on it. It’s crazy, no one would ever do this even if they had the feature. Super high quality touch screen. 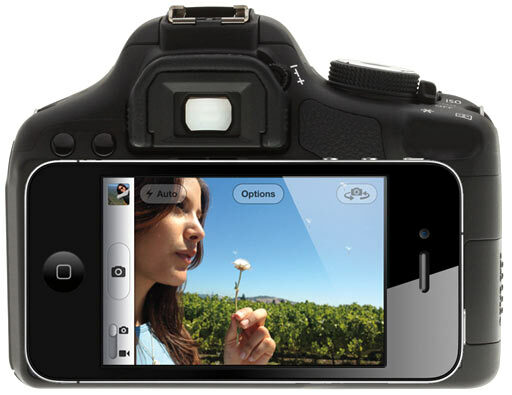 Use iPhone to configure presets and settings or as a viewfinder when necessary. Store photos on the phone, share photos with anyone on any service. Get your photos backed up to iTunes or iCloud’s Photo Stream wirelessly. Watch photos and videos wirelessly with Airplay. Get location tags on all photos. Use the phone as a reserve power source. Edit photo and video with apps from Instagram to iMovie. Use advanced developer tools to extend this list to your liking. OK, stop me, or I can just list all the iPhone features and say they are now features or this awesome DSLR. Since you don’t have to include all this stuff with the camera, it will be dramatically cheaper to produce. And since it makes the camera so much more useful, it’s an incredible profit opportunity. How come nobody has done it yet?